Improves your BDC's overall efficiency by increasing your DMN close rate, average dollar per RO, appointment penetration rate and prioritizing your follow-up. BCP for Service effectively handles your Service and OnStar leads while generating more revenue. Here’s how it works. An OnStar notification is sent to your CRM. We work alongside the CRM and grab the OnStar lead. Next, we send an interactive email to your customer which allows them to set appointments based on the dates and times you provide. We then offer your customer additional services. 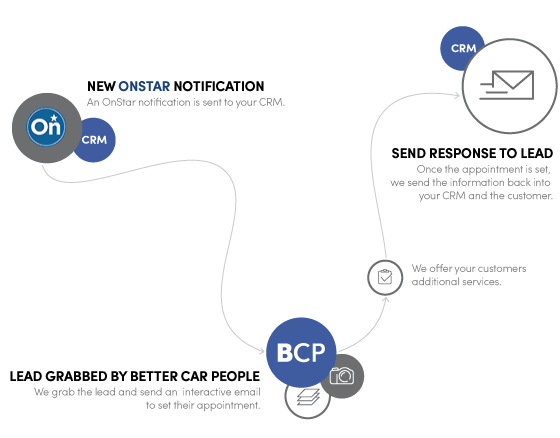 With BCP for Service, your OnStar leads are always responded to. Once the appointment is set, we send the information back into your CRM and to you. You’ll instantly see if an appointment is set or declined. When that daily rush of OnStar leads comes in, we answer every lead in less than 10 minutes. In other words, you keep working and your customers are taken care of. BCP for Service simplifies the service appointment process for the dealership and the vehicle owner by providing a quick and easy way to set an appointment and choose additional services. Does BCP for Service work with every CRM? Pretty much. It has complete functionality with over 30 CRMs. So contact us to see if we work with yours. Is BCP for Service an iMR turnkey approved product? There will be a huge increase in OnStar leads. How will BCP for Service help? Think of us as your automotive stress reliever. We make sure all of your leads are answered. In fact, your customers will have the opportunity to set appointments themselves and even choose additional services! We already have/are putting in place a Service BDC. Why do we need BCP for Service? With BCP for Service, we can take your current BDC and make it more effective. We like contacting our customers personally. Why use BCP for Service? Here’s the deal. We don’t take away the control of your leads or the contact with your customers. Customers can either choose to make the appointment via BCP for Service or they can use the click to call feature and be put in direct contact with you. We have a Quick Lube, so we don’t set appointments for oil changes. Don’t worry. We can modify the response for Quick Lubes in any manner you would like. We already have an online scheduling tool. How is BCP for Service different? Great question. BCP for Service is much more than a scheduling tool. Customers choose additional services and will be surveyed if they choose not to come in. In addition to this, you will receive a daily report with every OnStar lead, which customers opened it up, and the responses. "You can't find a better solution to respond to Dealer Maintenance Notification leads...very user-friendly." "I love working with your Better Car People website. It is easy to navigate. It allows us to prioritize our calls based on what customer already scheduled, what customer declined, and what customer opened the notification but did not take action. The section for customers comments helps as well. Knowing ahead of the call if the customer had a positive or negative experience lets us prepare ourselves for the call and know which direction to take the call into. Your suggestions are already helping as well. My team loves that they can view the customer comments as well so they're not so blindsided if they do get a customer who had a negative experience. We are working harder on advising customers who no longer own or who are out of our area to contact OnStar to change their preferred dealer. As well as prioritizing our calls." "I have worked with Scott Hendrick from Better Car People for years. He is my trusted go-to resource whenever needed. He is quick, efficient, and so helpful. Better Car People's solutions for Service and Sales response assistance is a key piece to our development and retention efforts here at Heidebreicht Chevrolet. I would highly recommend doing business with them."